Since the sun was shining brightly last Tuesday, I wasn't expecting to get rained on while walking to my car after work. At least that sprinkling surprise lead to seeing my first rainbow of the spring! Sharolyn from Authentic Native Made captured the end of the color spectrum during a SPSteam game. 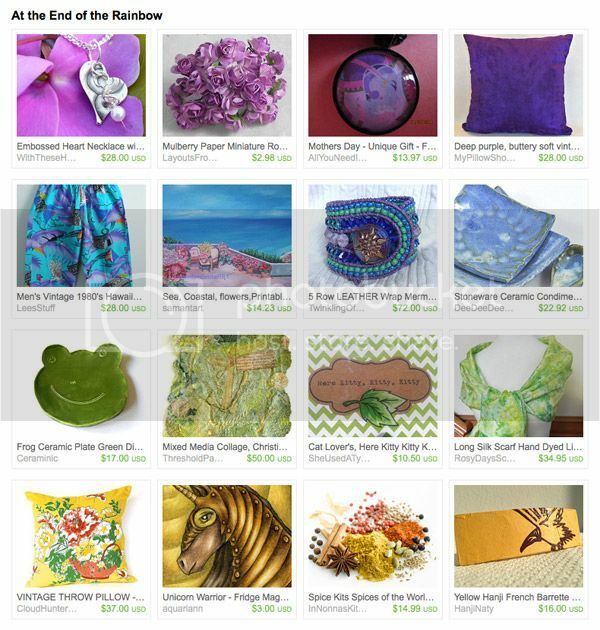 Her colorful gift ideas include deep purple suede pillow by My Pillow Shoppe, forest green frog plate by Ceraminic and my golden yellow unicorn magnet. This gorgeous flora and fauna of SPS team! Tenderness of greens of spring! Not been featured, nor made one last week, but I love the one that you posted!!!! Ooh, I haven't been making treasuries this week - but I'll look out for the ones featured here! Beautiful! Love the color coordination, really lovely! a SUPER treasury, love the unicorn! Love the mix of colors in this T!